The Filmfare Best Film Award is given by the Filmfare magazine as part of its annual Filmfare Awards South for Tamil (Kollywood) films. ^ "Winners of the 65th Jio Filmfare Awards (South) 2018". ^ "Winners of the 64th Jio Filmfare Awards (South)". ^ "Winners of the 63rd Britannia Filmfare Awards (South)". ^ "Winners of 62nd Britannia Filmfare Awards South". ^ "Winners of 61st Idea Filmfare Awards South". ^ "List of Winners at the 60th Idea Filmfare Awards (South)". ^ "59th Idea Filmfare Awards South (Winners list)". ^ "Filmfare Awards winners". The Times Of India. 9 August 2010. ^ "54th Fair One Filmfare Awards 2006 - Telugu cinema function". ^ "`Anniyan` sweeps Filmfare Awards!". Sify. Archived from the original on 26 September 2014. ^ "Filmfare awards for South India — Telugu, Tamil, Malayalam & Kannada — Telugu Cinema". 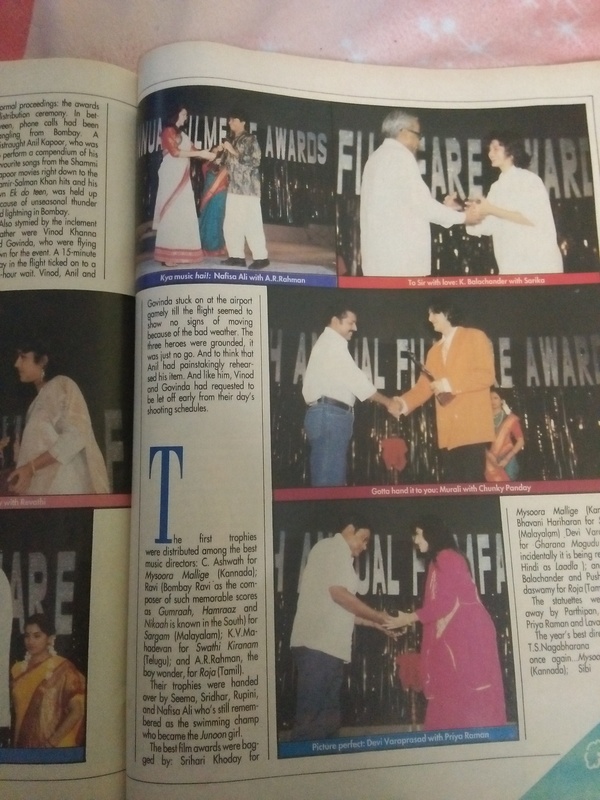 ^ "Pithamagan sweeps FilmFare Awards". ^ "Manikchand Filmfare Awards: Sizzling at 50". BSNL. Archived from the original on 21 July 2011. Retrieved 19 October 2009. ^ "Nuvvu Nenu wins 4 Filmfare awards". The Times Of India. 6 April 2002. ^ "Vishnuvardhan, Sudharani win Filmfare awards". The Times Of India. ^ "The Hindu : Star-spangled show on cards". Archived from the original on 15 July 2006. ^ "46th Awards" (JPG). ia601506.us.archive.org. 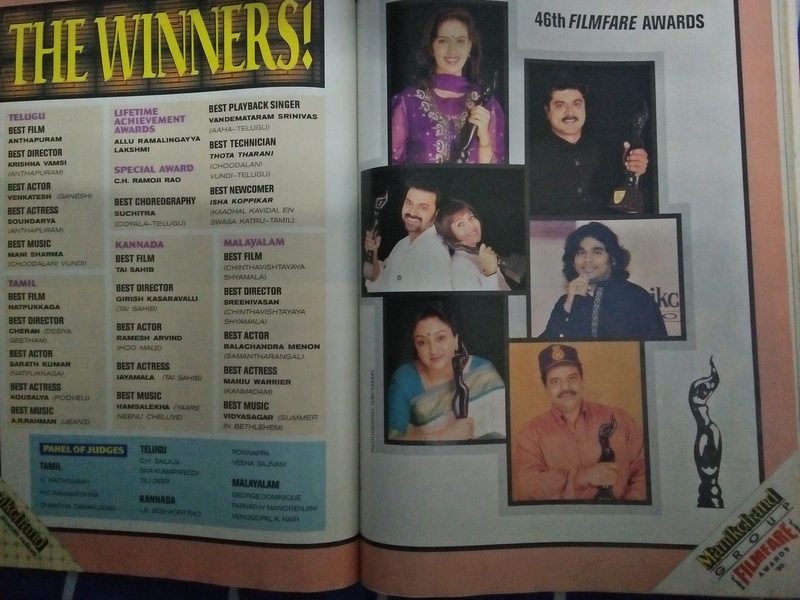 ^ "Filmfare - South Special". 3 November 1999. Archived from the original on 3 November 1999. ^ "42nd Filmfare Tamil Films Winners : santosh : Free Download & Streami…". 7 February 2017. Archived from the original on 7 February 2017. ^ "41st Awards" (JPG). ia601507.us.archive.org. ^ "40th Awards" (JPG). ia601506.us.archive.org. ^ "39th Annual Filmfare Tamil Best Director Film Music : santosh : Free …". 8 February 2017. Archived from the original on 8 February 2017. ^ "Vidura". C. Sarkar. 2 December 1990 – via Google Books. ^ "Vidura". C. Sarkar. 2 December 1989 – via Google Books. ^ "35th Annual Filmfare Awards South Winners : Santosh : Free Download &…". 5 February 2017. Archived from the original on 5 February 2017. ^ "34th Annual Filmfare Awards South Winners : kumar : Free Download & S…". 28 May 2017. Archived from the original on 28 May 2017. ^ "Collections". Update Video Publication. 2 December 1991 – via Google Books. ^ "The Times of India Directory and Year Book Including Who's who". 2 December 1982 – via Google Books. ^ Thamizh Thirai (23 February 2014). "Rare Video of 27th Annual Film Fare Awards - 1980 (Voice Over - Radhika Sarathkumar)" – via YouTube. ^ "The Times of India Directory and Year Book Including Who's who". 2 December 1980 – via Google Books. ^ "The Times of India Directory and Year Book Including Who's who". 2 December 1979 – via Google Books. ^ "The Times of India Directory and Year Book Including Who's who". Times of India Press. 2 December 1978 – via Google Books. ^ Reed, Sir Stanley (2 December 1980). "The Times of India Directory and Year Book Including Who's who". Bennett, Coleman & Company – via Google Books. ^ Reed, Sir Stanley (2 December 1974). "The Times of India Directory and Year Book Including Who's who". Bennett, Coleman & Company – via Google Books. ^ "The Times of India Directory and Year Book Including Who's who". 2 December 1973 – via Google Books. ^ (Firm), Times of India (2 December 1970). "The Times of India Directory and Year Book Including Who's who". Bennett, Coleman & Company – via Google Books. ^ Reed, Sir Stanley (2 December 1968). "The Times of India Directory and Year Book Including Who's who". Times of India Press – via Google Books. ^ Reed, Sir Stanley (2 December 1965). Server+Sundaram "The Times of India Directory and Year Book Including Who's who". Bennett, Coleman & Company – via Google Books. ^ "The Times of India Directory & Yearbook, Including Who's who". Times of India Press. 2 December 1964 – via Google Books. ^ "62nd Filmfare Awards (Tamil): 'Madras' Overtakes 'Kaththi'!". www.filmibeat.com. ^ "The 55th Filmfare South Awards in Chennai on July 12". Televisionpoint. Bhash Media Private Limited. Archived from the original on 31 July 2013. Retrieved 28 June 2012. ^ "49th Annual Filmfare Awards - South". 23 May 2013. Archived from the original on 23 May 2013. Anandan, ‘Film News' (2004). Sadhanaigal Padaitha Thamizh Thiraipada Varalaru [Tamil Film History and Its Achievements]. Sivagami Publications. p. 738.